New Zealand captain Brendon McCullum has declared day-night Test cricket "here to stay" after the conclusion of the inaugural floodlit match at Adelaide Oval, a popular success despite its meagre three-day running time. A crowd of 123,736 poured into the ground across those three days, and similarly strong television audiences made it a spectacle to delight broadcasters and administrators alike. But the verdict of the players was always going to be critical to the future of the concept, and in the glowing words of McCullum and his opposite number Steven Smith there was ample evidence that the game's elite practitioners will be comfortable with doing this kind of thing more often. The only reservation raised by both McCullum and Smith was the amount of grass left on the Adelaide Oval pitch, which they agreed was the major factor in the game's short time span. But they were equally adamant that players would be able to adapt with greater experience, with the added incentive now of having played a Test match in front of such a celebratory and voluminous gathering. "It's a great concept," McCullum said. "As pink ball cricket evolves as I am sure it will grow into a global game and I think we will see the pitches probably won't have quite as much grass on it. 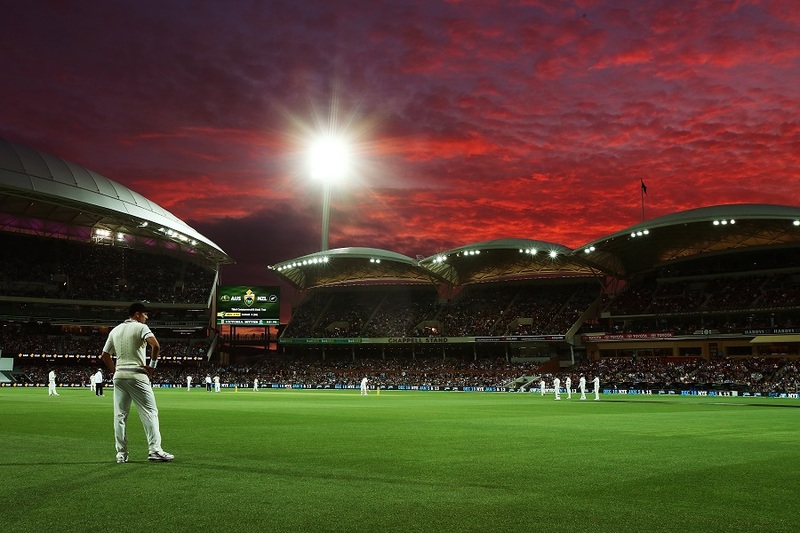 The thing about day-night Test cricket is it is meant to allow Test match cricket to be played at night time, it is not meant to be to change how Test cricket should play. "There was a fraction too much grass on it, I think we saw under lights that the pink ball probably responded a little bit much, but I would say that because I am a batter. Overall it was a roaring success and 120,000 people over three days, people are voting with their feet and I think it's here to stay, which is great. "In general, spectators would want see results in games. And will want to see captains start to try and force results. Sitting in changing room after hard fought Test win that's what's most memorable as a cricketer. Sometimes fighting draws are great and I think we'll find captains will try and push home some advantage to get Test victories." Smith was naturally relieved after seeing out a series victory over a fast-finishing New Zealand, and he had little hesitation in describing the contest as a "great" one. "The whole Test match was a great innovation, it was a great spectacle," he said. "To get 120,000 people through the gates in three days is absolutely amazing. I thought it was a great spectacle and a great Test match. "It was a game that was dominated by the bowlers. New Zealand's bowlers bowled just as well as ours. But it was one of those games - if you got yourself in you could still score runs, it just wasn't to be this game for a lot of the batters, we got starts and couldn't go on with it. I think the contest is there if you're willing to have a game plan and bat some time you can certainly score runs." Like McCullum, Smith noted the thick grass coverage presented for the pink ball, but was happy enough to live with that after finishing the match as a narrow winner. "I think the wicket here compared to the two Shield games that have been played on it and particularly the pink ball shield game we played, it looked like the grass was a bit more lively," he said. "I think it was the same height as the grass in the Shield game but it was probably just a tad greener. "That created a little bit more movement for the bowlers and kept the ball together and swinging for a long period. But I think it was great to see something different, the first two Test matches were dominated by the bat, so it's great to see something different and see the bowlers coming into their own."